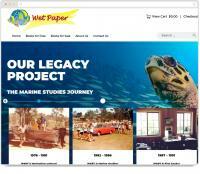 Wet Paper is a Queensland based publishing house which produces, curriculum materials for secondary schools nationwide wishing to educate students about the sea. Wet Paper already had an extensive inventory of hard copy books, but for those out of print, Wet Paper wanted to sell these electronically to schools. We built a highly customised shopping cart experience that allowed users to not only buy hard copy books, but also buy an electronic key for online (or ebooks). We also allowed schools to buy a “class set” of eBooks, allowing schools to purchase a licence on behalf of their students. The authors copyright was controlled by having a “read only and printable versions” of a flipbook, whereby authors could either receive royalty payments from the publisher based on sales or copyright agency (CAL) payments for printed versions. A fully customised shopping cart experience from both a design and functionality perspective. Shopping cart allows users to order a combination of eBooks and hard copy materials in one transaction. Allow instant delivery of eBook keys via email. Allow schools to buy different kinds of keys to different kind of books. Some keys allow access to one person only (e.g the teacher), other keys allow access to up multiple people (e.g 30 students or one class). Tracking of student access, and security control – ensuring keys are only used for up to their allowed “uses”. Security to make users cannot “share” accounts. When viewing an ebook, allow users to search, zoom and in some cases print. Provide an optimised view of eBooks for mobile devices. Tracking of students individual page views, allowing teachers to view a “class list” of students, and seeing what pages of the ebook were accessed. Integration of system with Google eCommerce analytics allowing in depth statistics about sales and users.